So apparently, part of becoming an adult means cooking your own meals. Now for the not culinary minded, like myself, this may be a daily challenge for you. 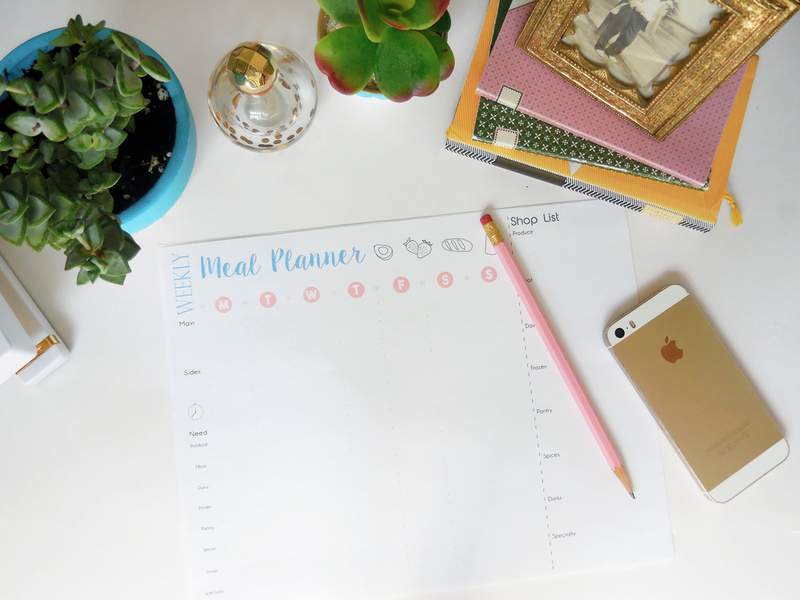 To make life a little easier I created a meal planner for myself, and now for all of you! I find planning out my meals a week in advance to be extremely helpful when it comes to budgeting and eating healthy, and it saves me loads of time in the grocery store. Especially by having my shopping list arranged by type of food. No running around back and forth between aisles to grab something I forgot back in produce. 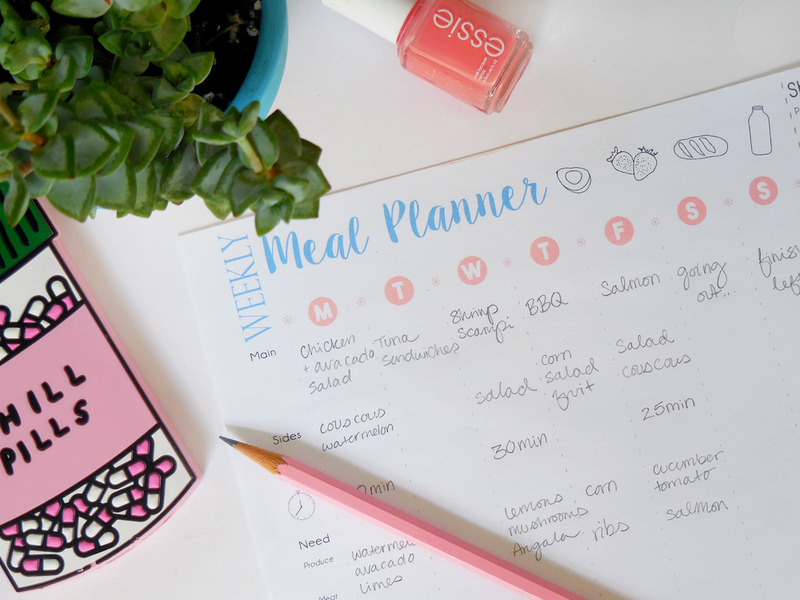 The meal planner itself is organized very simply; under every day you can write the main meals you're planning on making at the top and sides or smaller meals underneath. (I use this mostly just for dinner, and sometimes lunch, cause really, who plans out their breakfasts?) Then I like to put how much time it'll take me to prepare the meal. I find this to be helpful when deciding what I want to make on which days and if I'll have time to make a meal that takes 45min or 20min depending on what else I have going on that day. At the bottom you can write down just what you'll need for that day. Once all the days are filled out I write everything over in the master shopping list. This avoids any overlaps in ingredients and also lets me see what foods I'm already working with as a plan, in case I want to use something more than once. 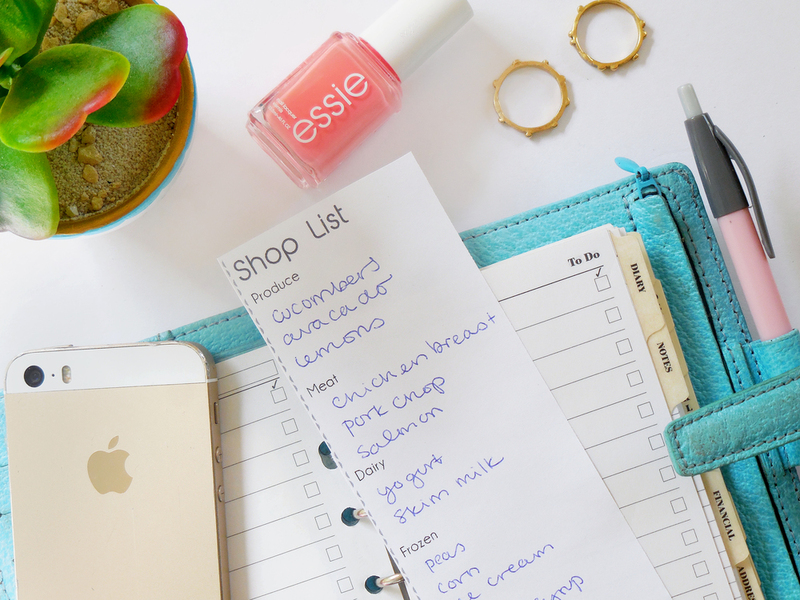 The master shopping list is easily detachable from the rest of the page so it's easy to take with you to the store. I like to just pop it in my daybook or wallet and I'm good to go! Planning my meals like this has become super helpful for eating healthy and not giving into impulse purchases at the grocery store. Since I know that everything I'll need for the week is on my list I'm less likely to stray from it when temptation strikes. Planning out my meals a week in advance means I'm not rushing home one night with nothing to eat and end up ordering take out or resorting to mac and cheese. And I actually really enjoy sitting down once a week and going through Pinterest and cooking blogs to decide what I want to make that week. If I'm feeling adventurous I might try something new or challenging, or if I'm having a busy week I can fall back on one of my old favorites. Either way, picking out meals that are nutritious and yummy makes me excited to cook each night, something I dreaded for many years. I suppose I'm slowly but surely getting closer to becoming an adult!